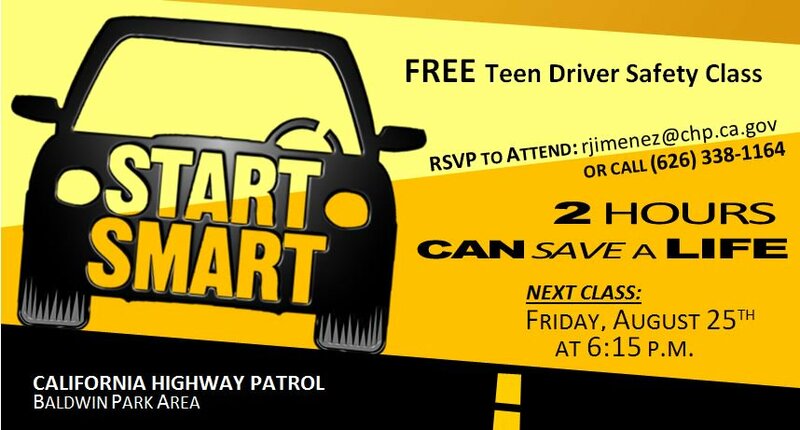 The California Highway Patrol is hosting another session of it’s popular “Start Smart” teen driving class this Friday in Baldwin Park. The free, two-hour class — designed for young drivers and soon-to-be drivers between 15 and 19, as well as their guardians — will be held at 6:15 p.m. Friday at the CHP’s Baldwin Park-area office, 14039 Francisquito Ave. in Baldwin Park, according to California Highway Patrol Officer Rodrigo Jimenez. Officers will discuss collision avoidance and other aspects of safe driving. Videos depicting the tragic consequences of bad decision behind the wheel will be shown. A parent or guardian must attend with each student. Spaces often fill quickly, and those interested are urged to reserve a spot early. For more information, or to reserve a space in the class, email Officer Jimenez at rjimenez@chp.ca.gov or call 626-338-1164.